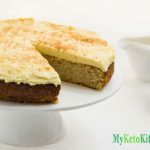 Keto Cake - Cinnamon and Nutmeg - Moist & Sweet! Our cinnamon Keto Cake recipe gives off the delicious aroma of cinnamon and nutmeg when baking and the scent lingers. Grease a 10in round baking tin with butter and line the base with parchment paper. In your stand mixer, place the butter and cream cheese. Mix on medium speed until well combined and smooth. Turn off the mixer and add the Natvia, cinnamon, nutmeg, cloves, salt and baking powder. Mix on low speed until combined. Add the coconut flour, almond flour and eggs. Mix on low speed until the flours and eggs are combined. Scrape down the mixing bowl then mix on medium for 2-3 minutes until all ingredients are well combined. Pour the cake mix into your prepared baking tin and bake for 30-40 minutes. The cake is ready when it springs back from being touch and an inserted skewer comes out clean. Remove the cake from the oven and allow to cool in the pan for 10 minutes. After 10 minutes turn the cake out onto a cooling rake and leave to cool completely. When the cake is cool, make the frosting: Place the cream cheese and unsalted butter into your stand mixer and mix on medium until they are combined and smooth. Turn your mixer onto low and add the Natvia Icing Mix one spoon at a time to prevent it from being sprayed over your kitchen. Add the cinnamon and heavy cream and mix for another 2 minutes. Spread the frosting over your cooled Spice Cake, cut yourself a serving and enjoy.